Maybe you inherited an old-fashioned, hand-cranked (or electric) ice cream freezer. Or perhaps you retrieved your own down from the rafters and dusted the cobwebs off it. In any case, you don't have any instructions, and can't really remember the process. 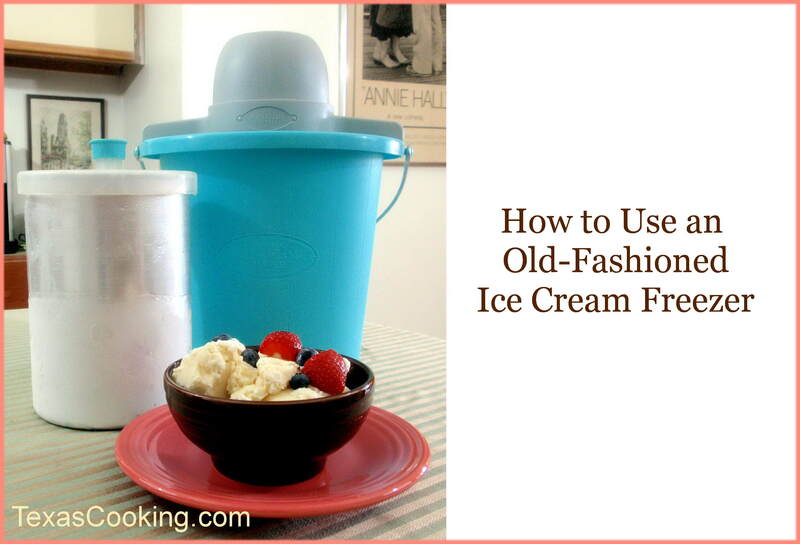 All old-fashioned ice cream freezers, regardless of make and model, pretty much work the same way. What follows are step-by-step instructions that will demystify the process, as well as links to some of my favorite homemade ice cream recipes. So, pay attention, now. To make and pack up to 4 quarts of ice cream, you will need about 15 pounds of crushed ice and either 4 cups of table salt or 6 cups of rock salt. Refer to the table below for more information. Wash the beater (often referred to as the "dasher"), top and cream can well before using. Let the parts cool before using, as you will get much faster freezing of your cream if parts are cold. Put the beater in the can, making sure it is set well in bottom of can. Pour in the mixture to be frozen, made from your favorite recipe or one of the recipes linked below. The mixture should be cool before pouring it in the can for faster, more even freezing. Fill the can only two-thirds full (up to the fill line stamped on can) to allow for expansion. Put the top on the can and place can in the tub, making sure that the can is centered on the can rest in bottom of the tub. Attach the motor (or cranking mechanism if hand operated) making sure beater is still set properly in can and can is still on bottom rest in tub. Latch down well by pushing thumb lock over prong on frame. Plug motor in on electric model before packing ice and salt (Step 6). The can will begin to turn steadily to the right. On manual models, you start cranking as soon as the tub is packed. Turn the crank steadily to the right (avoid turning left), not too fast. Note: The beater is not made to turn. It stays still, and the can turns around it. In packing, put about three inches of ice in the tub all around the can, and sprinkle about 3 ounces of table salt or 5 ounces of rock salt, evenly over the ice. Continue adding ice and salt (in the above proportions), layer by layer, until tub is filled up to, but not over, the top of can. When the tub is half full (approximately two layers of ice and salt), pour one cup of cold water over the ice and salt mixture. This will help the ice to melt and settle, which will shorten freezing time, and will help keep ice from jamming and causing stops. After tub is filled, pour another cup of cold water over the ice and salt. As the ice melts and settles, you will need to add more ice and salt to keep it up to, but not over, top of can. Before the cream is finished, the ice will melt enough to cause water to flow from the drain hole in the tub. Never let this drain hole become stopped up with ice. (The cork supplied is not for this drain hole; it is for the can top (see Step 9). Electric - The motor should run for 20 to 30 minutes or until the cream is the consistency of mush. On most electric models, the motor has an automatic reset switch which will prevent motor damage when it naturally stops when ice cream is ready or if, for some reason, it stops before the ice cream is ready. If the freezer stops and the motor is not unplugged, the motor will cut off and stay off until it cools down. It will continue to cut off and on until the motor is unplugged. This off/on action will not cause any motor damage. The freezer may become clogged with chunks of ice, which can cause the unit to stall before the ice cream is ready. If this happens, simply restart the unit by turning the can with your hands. Hand Operated - The freezing period should take about 20 minutes of steady cranking. After the can becomes fairly hard to turn, the ice cream is ready. At this point, continuing to turn is not necessary. This next part is really a two-person job. After the ice cream is ready, remove the motor unit (cranking mechanism if hand operated). Wipe all ice and salt from can top and then remove the top. Hold the can down on the bottom rest while pulling the beater out of the ice cream. The ice cream should be about the texture of mush. Scrape the ice cream from the beater and pack it down with a long-handled spoon. To ripen (that is, harden) the ice cream further, go to Step 8. Ripening and Hardening Ice Cream - After the cream has been packed down, place the cork in can top, and put can top back on the freezer. Repack the freezer (allowing water to remain in tub up to the drain hole), with more ice and salt (approximately 3 ounces of table salt or 5 ounces of rock salt, to every two double handfuls of ice), until can and top are completely covered. Cover freezer with a heavy towel or newspaper and set away in a cool place until time to serve. The ice cream will now freeze hard. If you want to hold the ice cream for more than an hour before serving, add more ice and salt (in above proportions) to keep the can and top covered. Many freezer cans are designed to fit into most refrigerator freezer compartments. Step 8 may be eliminated, and the ice cream can be ripened right in your refrigerator freezing compartment. The consistency of ice cream may vary from batch to batch. Several factors that will affect the firmness or consistency of ice cream are the recipe used, how hot or cool the day is, size of ice, temperature of the salt water, and temperature of the mixture before it is churned. If after 20 minutes of steady cranking on manual models you feel no drag or tightening, or if motor on electric model continues to run freely after 30 minutes, then the salt water is not cold enough, therefore, the ice cream is not hardening. You should add another 3 ounces of table salt or 5 ounces of rock salt. This will begin to reduce the saltwater temperature and cause the ice cream to harden. As the ice melts, you may have to continue to add ice and salt until the ice cream is the consistency of mush. If the cranking mechanism becomes too hard to turn in less than 20 minutes on manual models, or if motor stalls in less than 20 minutes on electric models, resulting in coarse or an inconsistent texture of ice cream, the saltwater became too cold too fast. In this case, you used too much salt and the ice cream froze too fast on the edge of the can, and/or you did not used crushed ice. Preparing the ice cream mixture the day before makes smoother ice cream and increases the yield.